Jan Jansz. Teck was the brother-in-law of the still-life painter Jan Jansz. den Uyl in whose workshop he trained in the 1620s, later collaborating with his teacher. Only a few paintings by Jan Jansz. Treck are known, one of which is a still life signed and dated 1641, which is considered to be among his earliest creations. According to a series of documents, the two artists remained in close contact, a fact that is evident in their output. The present canvas entered the Thyssen-Bornemisza collection in 1981 via the art dealer Silvano Lodi. It was acquired as a work by Den Uyl and appeared as such in the Collection’s catalogues. However, due to its style and the lack of a signature, Gaskell considered that it was likely to be by Treck although he acknowledged that it was difficult to distinguish the hands of these two painters in the 1640s and early 1650s. This still life is set in an interior with a background in the form of a niche and a pilaster that receive the light from the left. The few objects in the composition are arranged on one corner of a table covered with a plain brown textile and a folded, creased white tablecloth of a luminous white. Among the materials depicted the most striking is the metal of the pewter jug and the two plates as well as the silver Cupid that decorates the gilt stand on which the glass of wine rests. Other materials include the porcelain of the plate with the peach in the middle-ground and the glass of the fine wine glass and the sphere on which Cupid stands. The spatial depth is achieved through the pronounced diagonal created by the jug, which increases the sense of space by projecting its mouth over the edge of the table. The position of the plates creates a second receding line that breaks the verticality of the stand for the glass. 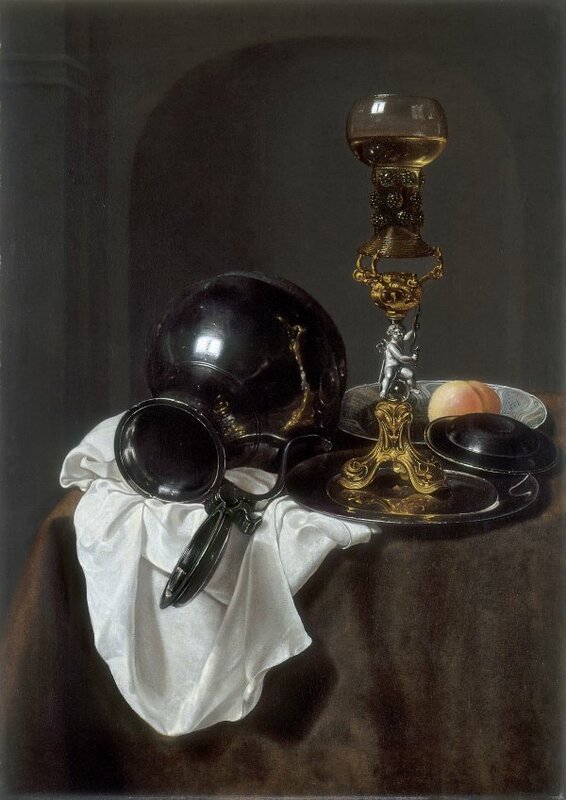 Some of the elements in this composition are to be found in works by Den Uyl such as the use of a vertical format, the choice of a white tablecloth, the arrangement of the objects that makes maximum use of the angle of the table, and the study of the different metals through their colours and reflections. Notable in this composition are the reflections of light on the upturned jug, which has a distorted reflection of the stand of the glass, as well as the different transparent and opaque materials. It has been thought that the delicate stand of the glass may be inspired by the work of the goldsmith Andries Grill who was in Amsterdam and The Hague in the 1630s. Gaskell referred to a piece by this craftsman which is comparable to the present one, now in the Municipal Museum in The Hague and dated 1642, in which Cupid and the sphere are supported by Bacchus seated on a barrel.